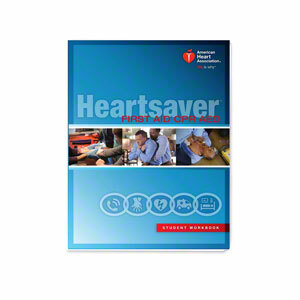 The AHA 2015 Heartsaver First Aid CPR AED Student Workbook is for a single student and contains information needed before, during, and after the course. It includes 144 pages of full-color text and images, one 5-panel Heartsaver First Aid Quick Reference Guide (15-1022), one adult and one child & infant CPR AED Reminder Cards. AHA’s Heartsaver courses are for those with limited or no medical training who need a course completion card in first aid and/or CPR and AED to meet job, regulatory or other requirements. Available in English or Spanish. Select language preference by using the drop-down window above.